The focus on environmentally friendly solutions continues to grow with more people making a conscious effort to ‘go green’ in their product and service choices. With the lingering fear of global warming and other threats to our natural environment continually being publicised, it’s not surprising that we are seeing a growing interest in the green movement. So how do you get your cleaning business’s eco image up to scratch without breaking the bank? Check out these five tips below to help you. The obvious first choice is to begin using Green Cleaning Products instead of traditional chemical cleaners. These products tend to be kinder on the environment, can be purchased for relatively the same cost as standard cleaning supplies and give your business that instant boost. Make sure you are getting the real deal by purchasing cleaning products which are certified by an independent company such as Good Environmental Choice Australia (GECA). 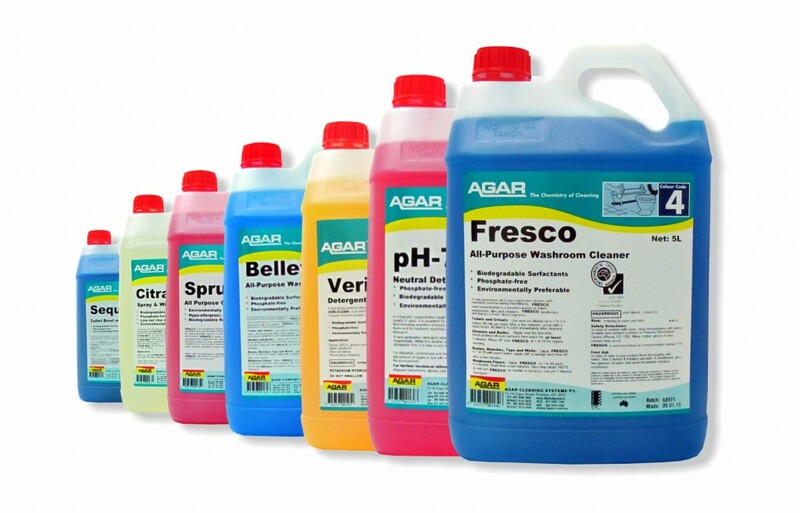 Agar has a range of Green Cleaning products which are certified by GECA, are biodegradable, phosphate-free, non-toxic and safe to use. Each product within the range is formulated to be high performance so that you don’t have to sacrifice cleaning power for green. If your business is office based, bump up your green credentials with these easy steps. Only print what you absolutely must! Store your files electronically and send emails instead of mail to reduce your paper trail. Don’t print emails you receive and opt to have all your bills sent to you via email. You recycle at home so why not recycle at work? Recycling paper in the office is now easier than ever with many Councils and commercial recyclers offering paper recycling services for local businesses. Recycled paper uses up to 50% less energy and 90% less water than making it from raw materials! Specialised companies are also offering solutions for recycling plastic and composting organic waste, greatly reducing your office’s impact on the environment! Australians purchase up to 2.4 million computers a year, greatly contributing to the growing problem of e-waste. Computers, monitors, phones and TV’s can all be recycled for their valuable parts through specialised companies such as TechCollect. Finally make a conscience effort to choose re-usable items and re-purpose furniture and equipment where possible. Remember; it all adds up! Keep the use of heating and cooling equipment to the minimum. Set air conditioners to a minimum of 25 degrees during summer and 18-21 degrees in winter. Each degree you don’t use can make a big difference to the overall emissions created. Stick to the highest rated energy units to further the benefits. Make sure you turn off all appliances and electrical equipment at night or when you leave your office for an extended period of time. Install sleep settings to all computers and devices to ensure that they aren’t using unnecessary power. Where possible invest in solar power panels to offset or completely cover your office’s electricity usage. You can also invest in a solar powered hot water system to further reduce usage and emissions. Not only will you save money on your bills but you will also be producing a cleaner, more sustainable energy source. For most cleaning businesses, travel is an essential part of servicing customers. To minimise kilometres travelled, schedule cleaning jobs in local areas on certain days. Speak to current clients about potentially swapping days or time slots and explain that you are trying to streamline your travel between clients. When it comes to business meetings why not make use of technology and schedule select appointments via Skype, video conference or teleconference. While it may not be suitable to always meet this way, it can cut down on considerable travel emissions when used as a regular alternative. Newer cars tend to use less fuel and are more efficient, reducing greenhouse emissions. Where possible, only purchase vehicles with better fuel consumption figures. Avoid ‘theoretical’ figures released from car manufacturers and instead look at real-world fuel consumption reported in road tests as they are a better guide. Regardless of what you are purchasing, items of quality tend to last longer, provide better performance and save you money in the long run. When selecting office equipment, business tools, cleaning products and cleaning supplies, such as vacuum cleaners, always go for items which advertise quality and high performance. Getting more out of your purchases means less items being thrown into landfill, less delivery, less money spent on items overall and in some cases, less power required to run the items. A quick and simple option for further reducing the environmental impact of cleaning supplies is to return the cleaning product bottles to Agar for refilling. When you receive your delivery from an Agar truck, simply leave out the used cleaning product bottles and Agar will collect them. Alternatively you can return them to Agar. This service is currently only available in the metro Melbourne area. Agar’s cleaning products come in 100% recyclable plastic bottles which can be disposed of in standard recycling bins or through a commercial recycling company. Taking these steps will help your business reduce its emissions and environmental foot print while helping to improve its ‘green’ image.